It took me a surprisingly long time to even attempt a photo on Astro Blasters. For some reason, even though I am objectively terrible at the game, it’s hard for me to put the blaster down and pick my camera up when I’m on that ride. But now I’ve finally got at least one shot that’s fairly representative of the ride as a whole. Good work, all you Space Rangers. 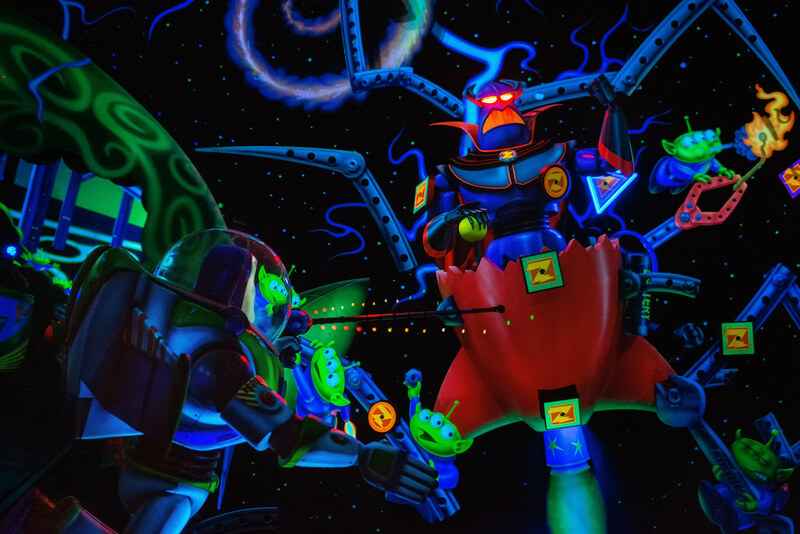 Thanks to you we’ve put a stop to the tyranny of Zurg. This entry was posted in Tomorrowland and tagged Astro Blasters, Buzz Lightyear, dark ride, Pixar, Toy Story, Zurg. Bookmark the permalink.